Edmonton, Canada (June 14, 2017) – A new scientific analysis by Wildlife Conservation Society Canada has identified a conservation gem nestled beside the two crown jewels of the Rocky Mountain national park system. The area, known as the Bighorn Backcountry, lies just east of Banff and Jasper National Parks in Alberta and represents one of the most ecologically important areas in the province’s Eastern Slopes region. Based on findings about the importance of this region to wildlife, clean water and recreation, WCS Canada is calling on the Alberta Government to designate the area as a Provincial Wildland Park in keeping with its recent commitment to conserve at least 17 percent of the province’s land base. “The area west of the Forestry Trunk Road #734 and east of Banff has a high concentration of vital habitats for vulnerable species like grizzly bear, wolverine, bighorn sheep and bull trout,” says Dr. John Weaver, Senior Conservation Scientist for WCS Canada who carried out the study. The area also lies in the headwaters of the North Saskatchewan River, a critically important water source for north-central Alberta, including Edmonton. Dr. Weaver points out that with projections of warming of 2°- 4° Celsius over the next 50-100 years, protecting the “water towers” located in the Bighorn that feed this major river will become even more important. Protecting the diverse habitat and topography of the region, which ranges from broad river valleys to snow-covered mountain peaks, will also be important for wildlife in the face of a changing climate. “Designation of a Wildland Provincial Park for the Bighorn Backcountry would help safeguard these vulnerable species and treasured waters to be enjoyed by people today and generations yet to follow,” Dr. Weaver says. Dr. Weaver synthesized data on four key wildlife species (grizzly bear, bull trout, bighorn sheep and wolverine) provided by Alberta government and university scientists to produce detailed maps of habitats for each species. He also assessed the value of the major rivers in these headwaters as likely movement corridors that fish and wildlife could use in response to warming temperatures. 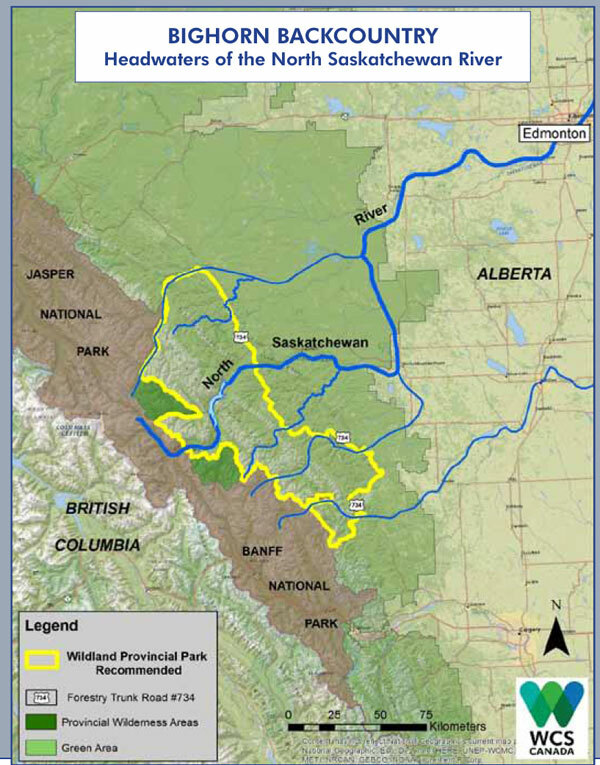 Based upon this analysis, a Wildland Park spanning approximately 68 percent of the Provincial lands there would conserve 93 percent of the most important habitats for these vulnerable fish and wildlife. “A Wildland Park in this area would protect spawning habitat critical to bull trout (Alberta’s provincial fish); cliffs and slopes used by bighorn sheep, especially during the tough winter period; secluded areas for grizzly bear females that can be killed or displaced from prime feeding sites near secondary roads; and denning habitat for wolverines, which may increasingly need to move to higher altitudes to find deep snow,” Dr. Weaver explains. “These high conservation values, the presence of important headwaters, and the proximity to two major national parks makes this an excellent place to start with meeting Alberta’s new protected area commitments. The Bighorn Backcountry is a real treasure and its value will only increase as our climate changes and Alberta’s population grows,” says Dr. Weaver.